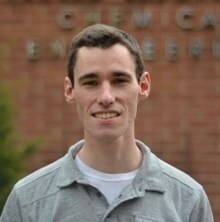 Patrick Saboe graduated with a bachelors degree in Chemical Engineering from the University of New Haven in 2011. Previous research includes a summer internship with the Mascaro Center for Sustainable Innovation at the University of Pittsburgh in 2010 where his primary work was to study mirco-algae based bio-fuel production from wastewater treatment processes. Patrick has chosen to research biomimetic membranes due to the implementation of highly selective and efficient separation processes that may result from this research. He is also working on making devices using photosynthetic protein 2D crystals. He is currently a EPA STAR Fellow.